On the internet, if you were to blindly ask a question like, what’s the most bulletproof engine ever made? 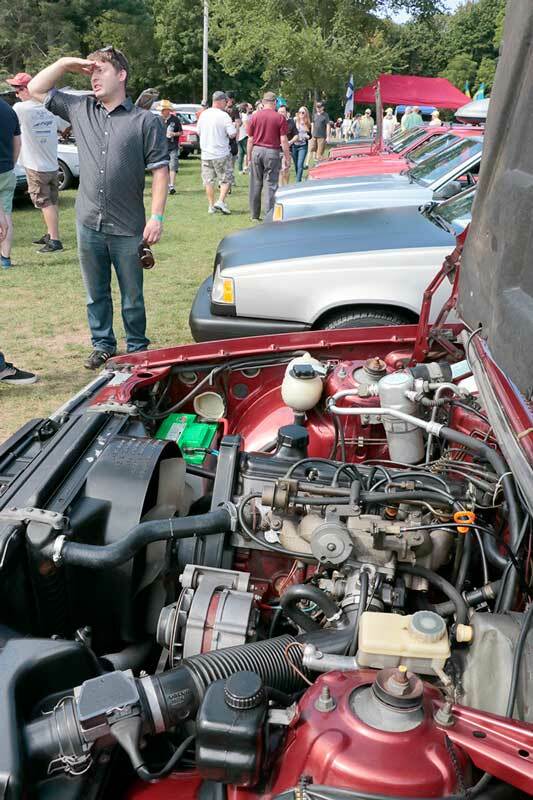 You’d get a lot of responses like Ford Modular V8, BMW m54, Toyota 2Jz, GM LS1, Mercedes OM617… After a bit of silence a few people would chime in with “Saab…” before quickly being trampled by a crowd of devout Turbobrickers, as they chant VOLVO REDBLOCK with pitchforks and torches alight. The thing is, while sometimes it’s hard to understand how a group of enthusiasts swung so hard towards the boxy Volvo’s of the 80’s and 90’s, one thing is for certain. These cars wear exceptionally well, and here at eEuroparts we’re glad to continually see 30 year old Volvo’s arriving for parts every week. Many of the 80’s Volvos that pull up at our CS customer pickup area to buy Volvo parts have over 300k miles on them and just keep chugging along. One reason for this is the simplistic and overbuilt approach to designing and manufacturing these cars. You’ll notice a theme when looking through parts. Brackets are rectangles. Windows are Rectangles. Panels are rectangles. Mounts are rectangles, with the odd square thrown in to spice things up. Why over-complicate? All hail the right angle! The B230FT is basically the top trim Redblock engine, and was cast from the fires of pure low tolerance functionality. On paper, it look’s pretty normal, and very Swedish. The slant 4 format allowed easy packaging for intake and exhaust manifolds. The engine block is iron, and has a solid and sturdy closed deck. Guess what, they painted it red! It has a crossflow aluminum 8 valve cylinder head housing a single belt driven camshaft, and 2 sodium filled valves per cylinder. This is known as the 530 head. Volvo fitted another head, the 531. The 531 8v head came on a number of similar engines, but never the B230FT, and features port bias and flow enhancement. It’s a common upgrade for the B230FT tuners. 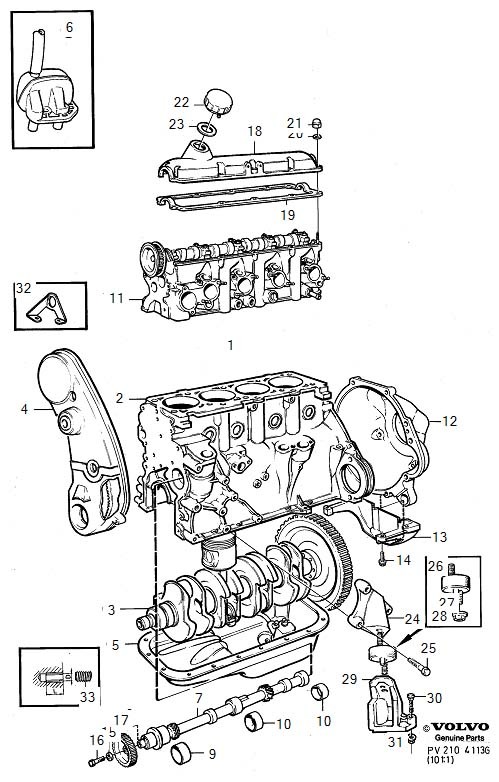 A single balance shaft is utilized to dampen vibrations. Even so, the entire Red Block family is known to be rather tractory. Pistons are dished to lower the compression (the ‘F’ in B230FT) to support the addition of either a Mitsubishi TD05 or Garrett TB254 turbocharger (The ‘T’). An air to air intercooler brings charge temperatures down. The B230FT belongs to the “Low Friction” family introduced in 1985, which received shorter pistons, smaller main bearings, more counterweights on the crankshaft, and longer, thinner connecting rods than earlier B21 and B23 engines. To accommodate the different rod, the wristpin was moved slightly up. This design helped introduce the common problem of ‘piston slap’ with age, where the piston teeters back and forth on the wristpin, ‘slapping’ the cylinder walls. This problem was addressed with a technical update known as the ‘K’ engine somewhere around 1989. Volvo is the type of company to just change things mid way through the year, so there are some inconsistencies of when this actually happened. I suppose they felt the update was urgent enough to immediately start. Even still, many of the early engines have been driven around with the issue for over 100k miles and were just fine, if not just a little noisy. The ‘K’ engine enlarged the main bearings from 55mm to 63mm and moved it from the #3 journal to the #5 journal. The thrust bearing was also moved from the #3 journal to the #5, and a larger PCV oil separator. About a year later, some more improvements were ready for installation. That involved longer piston skirts, fatter connecting rods (9mm to 13mm), and oil squirters were added. These later 91-94ish B230FT engines are favored for swaps into earlier cars, since they bolt right in and features the all the most recent evolutions. That’s provided that you haven’t found a 16v Penta marine variation (which got all the goodies), but that crazyness won’t be tackled here. In stock form, this engine produces a somewhat asthmatic, but good for the time 165hp, allowing the 200/700/900 series cars that it was installed in to get to sixty in under 10 seconds. Fwew. Now in 2018, it’s not uncommon to see these engines piecemealed together and boosted well past 300hp. One good example is Mike Kornely’s outrageously cool 242 that we have the pleasure of seeing at eEuroFest every year. See more about that build [here]. 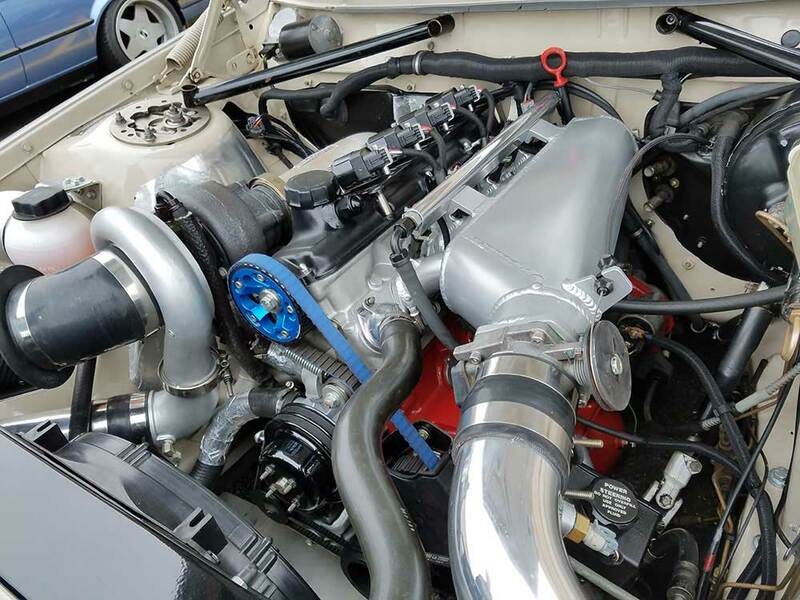 The B230FT is a stark contract to the S55 detailed in the last Get To Know An Engine. With low tolerances and simple engineering, it is able to triumph as a strong workhorse that’ll put up with whatever you throw at it. Stay tuned as we roll through significant engines of the past and present in the next edition of this series. If you have any suggestions for an engine you think is really special and deserves a highlight, drop it in the comments below! Quite a stark contrast to the White block that replaced it. I’d like to build a 242 GT with one and a 5 spd. That would get some attention. Very true, the whiteblock was a complete about-face in regards to technology and development. As a result it was able to be much more powerful (offsetting how heavy the newer chassis cars were), smoother, and more refined. However, working on one isn’t the joy that the B230 series engines are. My Canadian built 1987 240DL had the low friction B230. I retired the car for parts at about 550,000km due to rust. The engine was running fine and consumed about 1/2 litre in 10000km at that point. Less with a heavier or high mileage oil.